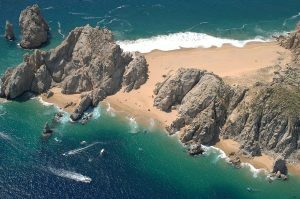 Lover’s Beach or Playa del Amor (correctly Love Beach) or Playa de los Amantes (Lover’s Beach) is located on the Sea of Cortez side of Land’s End at Cabo San Lucas, Los Cabos, Baja Califorina Sur, Mexico. Once known as Playa de Doña Chepa, Lover’s Beach or Playa de los Amantes, is another must, but to get to this hidden cove you’ll need some kind of floating transportation. Easiest is to hire a water taxi at the marina. The captain will take you on an informative tour of the diving areas around the arch (El Arco), point out Lover’s Beach, then go around the popular point for a wonderful view of the dramatic area where the Sea of Cortez meets the Pacific Ocean. We suggest you pack a lunch of your choice, some water and plan on spending the better part of the day enjoying Lover’s Beach and the striking wind and water shaped rock formations. Ask your skipper to come back for you at a pre-determined time…all for one price. Be most careful here, the powerful waves and currents of the Pacific make swimming quite dangerous. 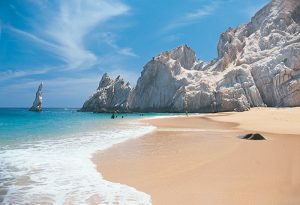 Swimming and snorkeling should only be attempted on the Sea of Cortez side of Lover’s Beach. also known as Playa Doña Chepa in earlier years. Like the pirates of long ago, you’ll dart in and back by boat from the front of Tesoro Los Cabos or El Medano beach across the bay. Kayaks and other water-sports equipment are also available at El Medano. Make sure you make return arrangements, boats are scarce after four or five p.m. Love Beach (or Lover’s Beach as it’s also known) has no services and swimming near the arch or the Pacific side of the beach is very dangerous. Stick to the bay side where schools of multi-colored fish are plentiful and the water is calmer and clearer. LOS CABOS DISCOUNTS AND SAVINGS. Save 35% – 70% on Activities, Dining & Restaurants, and Shopping. In conjunction with Los Cabos Magazine and Los Cabos Guide we are pleased to offer “Discounts with Los Cabos Prepaid Vouchers” for various activities, car rentals, restaurants, shopping and more in the Cabo San Lucas, Los Cabos area. It’s easy to save 35% to 70% on select activities, dining and restaurant, shopping, rental cars and more. 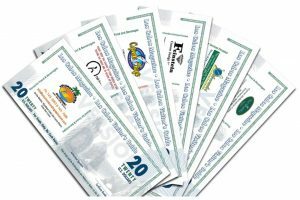 Learn more about Discounts with Los Cabos Prepaid Vouchers. Copyright © 2018 - All Rights Reserved - Los Cabos Guide ™ - Publicaciones Turisticas S.A de C.V.